Summary: A Get to Know You Game where the players share experiences that they have never done. Recommended Number of Players: Between 5 and 15, more if you have more time to play. Have everyone sit in a circle. Each player receives ten small wrapped candies of any kind. One by one, each player announces something that they have never done. 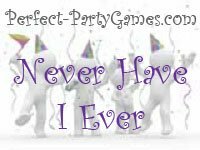 For instance,“Never have I ever gone skinny dipping.” For each true statement, all the other players throw one of their candies into a bowl in the middle if they HAVE done that thing. So, if three other people have gone skinny dipping before, those three people must relinguish one piece of candy. If a player runs out of items, they are eliminated from the game. Thus, it is a good strategy to say statements that most people have done, but you haven’t. You can either play the game until one player is left in the game and the prize is the bowl of candy, or you can stop when three players remain and those three get to share the candy in the bowl.